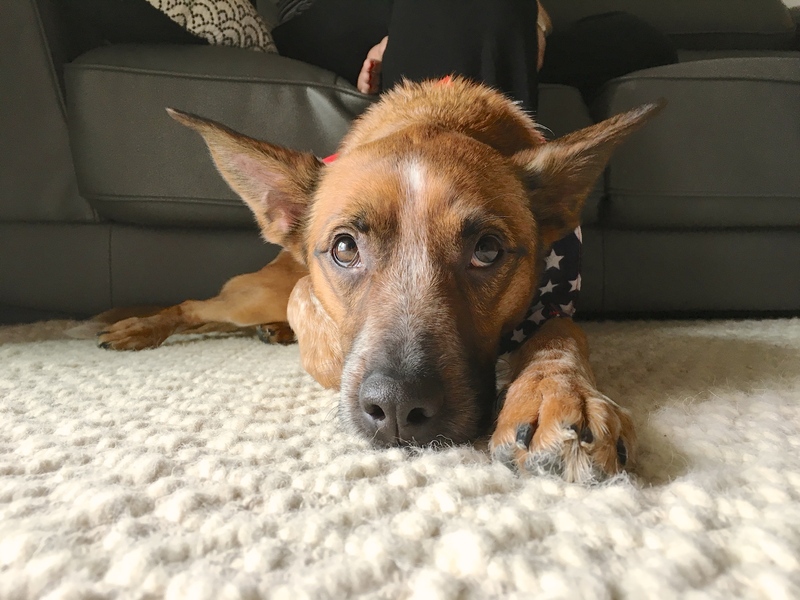 Briar is a three-year-old Red Heeler mix who jumps up on people, gets overexcited, over barks and has a case of separation anxiety; breaking out of kennels and opening doors to go and search for his guardians when left alone. His guardians were told he was an Australian Cattle dog but he looks and acts much more like a Red Heeler mix to me. In either case, Briar is a higher energy dog so I started off by asking how much exercise he gets. Most dogs need a good 45 minutes of exercise a day. As we were discussing this, Briar, started to nudge his guardians for attention. And each time he did so, they immediately started to pet him. Over time this can cause the dog to think he is in a leadership position over the human. After all, when he tells them what to do, they do it. To help the guardians return to a leadership position in the dog’s eyes, I went over a technique I like to call, Petting with a Purpose. Because he lives in an apartment instead of a home, Briar’s exercise is limited to walks. While this is a great activity to share with our dogs, for a higher energy working breed dog like Briar, its usually not enough. Because his guardians live near a popular biking trail, I mentioned that I like to drain my high energy dogs by roller blading with them. The great thing about rollerblading is you can burn a dogs energy very quickly, especially if you teach the dog to pull you along. After I finished my initial consult with his guardians, I took Briar into the apartment complex’s parking lot and strapped on my rollerblades to burn off his excess energy before we got to work. On our way to the elevator, Briar ran into a neighbor’s dog that he responded very strongly to. It was a cross between excitement and aggression and according to his guardians, is behavior he has shown before. I spent a few minutes trying to settle him down the while the other dog’s guardian was kind enough to wait just outside of their apartment, but it was way too intense for Briar. We headed outside and I threw on my rollerblades to do three or four laps around the complex’s parking lot with Briar pulling part of the way. Once he stopped running in front of me, I knew we were ready to get to work. We gave him a couple of minutes to recover, and then I fitted him up with a Martingale collar and added the special twist of the leash before going over the rules I like to use for a structured walk. Because he is such an athletic dog, it’s going to be extremely important for his guardians walk, run or rollerblade Briar every day in order for him to be able to relax and try to change his behavior around things he is reactive to. As I was explaining this to his guardians, the neighbor dog that we have ran into earlier, Mazy, was heading out for a walk with her guardian. As soon as Briar saw Mazy, he started getting very anxious; staring at her with a lowered head, breathing heavy, trying to pace around, licking his lips and whining. I tried to redirect him but didn’t have much success so I asked the guardian if I could borrow her dog to walk them together. Sometimes walking a dog next to another dog in a very controlled setting can help dogs learn to be less anxious in the presence of the other dog. It took about seven or eight minutes, but eventually I got both dogs to walk next to me in a heel position. After establishing the standard, I handed the leashes over to each dogs respective guardian so I could guide them on a structured walk together. After returning from our rollerblading dog walking adventure, I turned my attention towards the primary issue Briar’s guardians called me for help with, his strong aversion to being left inside his kennel. First off, I recommended that the guardians teacher and practice the “stay” exercise. Like many dogs with separation anxiety, Briar was in the habit of literally following his humans anywhere they went in the house. By teaching the dog to stay and placing him into a sit/stay position while his guardians get up to get a glass of water or use the bathroom, they can help Briar develop some self-control and realize that just because his guardians are not in his immediate sight, there’s no cause for concern. Before starting the exercise, I did a few test to determine how averse Briar was to his kennel. Fortunately, his dislike for the kennel was mild. After tossing in several high-value treats to create a positive association, I showed his guardians a simple exercise that they will be able to use to teach Briar to stay calm inside the kennel. Briar has a nice personality and is really a fun dog to be around, but I doubt that he was properly socialized as a puppy. This combined with too much pent up energy are likely the primary causes for his few behavioral issues. One of the most important parts of Brair’s rehabilitation will be getting him regular exercise to deplete his excess energy. While it is possible to rehabilitate a dog with excess energy, it is much more difficult to do so then with a dog who has been properly exercised. The good news is Briar is a bright dog who clearly wants to please his guardians. By the end of the session he was going in and out of the kennel without any hesitation or needing an invitation. The kennel homework that I gave Briar’s guardians will help the dog gradually become accustomed to staying calm inside of his kennel. If they’re able to practice this exercise multiple times a day, it shouldn’t take longer than a few weeks before Briar is able to stay in his kennel alone without incident.